In early March 2019, Hector Sr. and I (Megan – Azteca’s operations manager), headed to Mexico for a conference with La Costeña – one of the main suppliers of our imported Mexican food products. 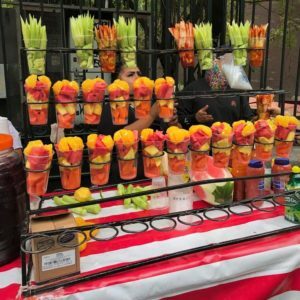 While it was a great opportunity to build relationships with the La Costeña team and our European counterparts, it was also a chance for Hector Sr. to show off some aspects of the food, sights and culture of Mexico City to those of us who had never visited before. In the next few posts, I will try to give you a taste of our exploits. Note the jacaranda tree in the background – Mexico City is full of them. We were lucky enough to stay at the Hotel W in the Polanco district of Mexico City which is described by most online articles as a “trendy” district. 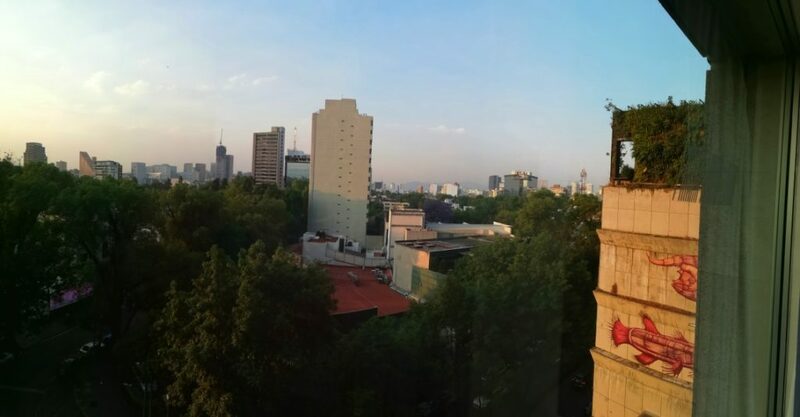 It’s easy to see why… Polanco is a beautiful, leafy area which does set it apart from the stark city surroundings at the heart of the city near the airport. It’s also a centre for major offices, so you tend to see smart business people striding along the sidewalk in the morning to work. What is a bit different to see, as an outsider, is that most of these suited power walkers tend to take a miss on the Starbucks up the street and rather stop at the little fruit stand on the corner for their breakfast of freshly prepared fruit, juice and a sweet bun for the road. Of course, we stopped for some fruit at one of these stands later in the week to try it out and it now makes perfect sense to me. The fruit in Mexico is so fresh and of such good quality that it is gorgeous just peeled, sliced and stacked in a plastic cup. It’s a great snack as you walk down the street to your important meeting; or in our case, a lazy Saturday morning exploring the local park. This fruit was actually one of my street food highlights of the trip. In the next post, I’ll show you some of the others. Great post Megs! I’m so happy you were finally able to experience Mexico to the fullest!